This past weekend my husband and I went to the Boston Globe-Horn Book Awards ceremony at Simmons College in Boston. It was a wonderful event, with the word’s nicest audience — children’s book people, librarians and teachers. 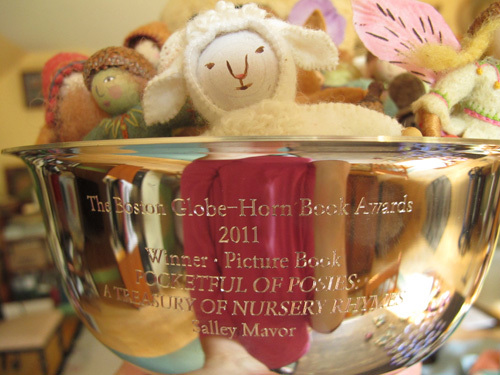 I accepted an award for my picture book, Pocketful of Posies and came home with this shiny engraved bowl. My name is even spelled correctly! 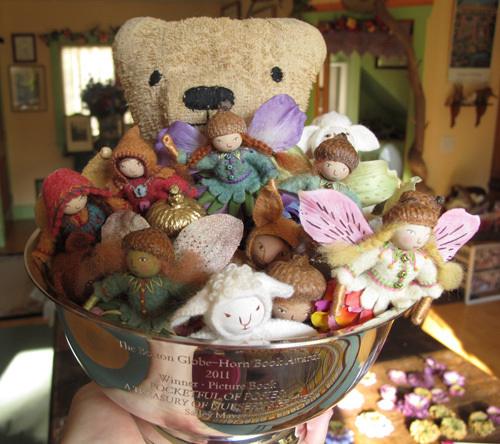 I immediately filled it with some wee friends, as well as my mother’s old teddy bear. As an award winner, I was asked to illustrate a cover of the The Horn Book Magazine, which will appear in their January 2012 issue. That same issue will publish this year’s award recipients’ speeches (including mine). Here is a peek at the illustration while I was working on it. I’ll show the finished product when it is published in the magazine in a few months. The magazine also plans on making it into a poster, which they’ll have available at meetings and conferences. 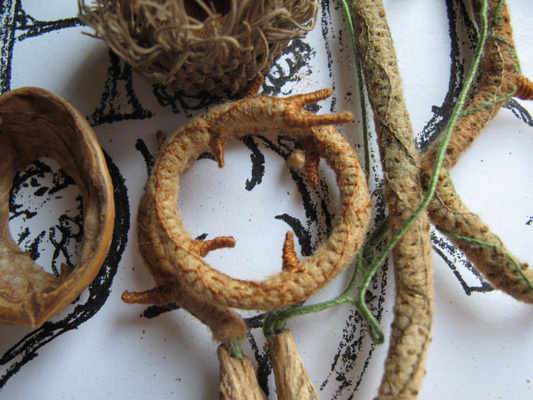 As you can see, I’ve formed the Horn Book title out of found objects and felt covered wire. I showed pictures of the process as part of my presentation at Saturday’s Colloquium at Simmons. I’ll be delivering the original to the photographer, Rick Kyle later this week and am looking forward to meeting him, since he did such a great job taking the pictures for my Posies book. A great big thank you the Horn Book for the award and the opportunity to share my work on the January cover of the magazine! Congratulations on your award. Your work is amazing! Congratulations! The Horn Book cover is looking great! Congratulations! Well-deserved! The beginnings of your cover are enchanting. I am so happy that you won this award, you deserve it! Congratulations. How exciting, Salley! Congratulations to you. The bowl is beautiful and something nice to hold your adorable little ones. Enjoy and savor your success!!!! Very well deserved – you surely earned it Salley! Love how you filled the bowl too. Congratulations Salley! Looks like even the cover you’re doing deserves an award! BRAVO! It’s about time, eh?!!! Many congrats for another richly deserved honor…bless you for your MANY wonderful children’s books, which are perfect for children of ALL ages! Kudos for a very well deserved award and recognation from your peers!!!!!!! Looks like a party! Everyone must be terribly excited. Oh, my, what a lovely award…so many congratulations!!!! 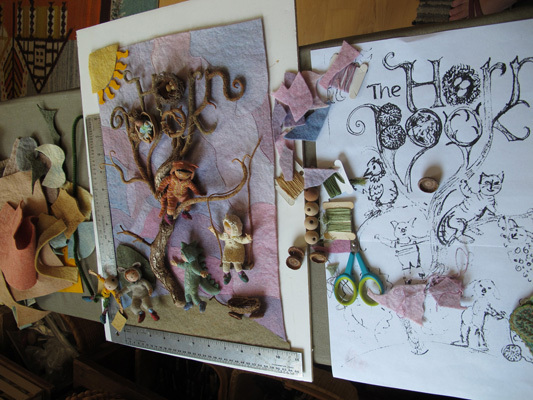 Can’t wait to see your book cover…just fascinating to see the work in progress!! Love your blog!!! Congratulations! What a lovely and well-deserved honor. So looking forward to seeing the cover! Hooray! How wonderful! And your new award could not possibly look any cuter! Love that Teddy, too! Congratulations!! Sally- your heartfelt comments about fabric art were a breath of fresh air on Friday night. I hope we see more of this from you -and others you inspire – in the future. Pocketful of Posies is a treasure. Thanks so much Pat. It was a great experience and I’m still spinning! I’d like to join the Slow Art Movement, too, please. It was wonderful to meet you this past weekend, Salley: congratulations, again! Three cheers for you, Salley! A well-deserved honor. Thanks for sharing all the details. Thanks for all the inspiration. Your work helps keep me going when I wonder if making small people, animals, and imaginary creatures is really a worthwhile pursuit. I can’t wait to see the finished cover. how fabulous! bravo! well deserved! congratulations and well deserved. your book is truly a wonderful source of inspiration!